ATLANTA, GA – EPIC Loan Systems, the industry’s most innovative and powerful loan management system, and IDology, a leading identity verification provider, today announced a partnership to improve the lead evaluation and underwriting process for the payday loan industry. IDology’s identity proofing solutions is now integrated with EPIC Loan Systems to deliver customers with unique and powerful insight about the validity of a person during the lead evaluation and underwriting process. EPIC Loan Systems’ provides turnkey solutions for lenders to process leads more effectively and identify the most profitable borrowers, while simultaneously deploying and managing underwriting strategies configured to isolate and reject high-risk consumers and potential fraudsters. 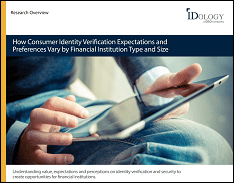 IDology’s solutions provide a very flexible and configurable identity verification solution that escalates to a higher level of verification when needed and quickly determines someone is who they say they are. EPIC Loan Systems was created by highly-experienced payday industry lenders who recognized the need for better, more efficient system technologies that could meet the rigors of today’s more demanding economic, regulatory and online-based market challenges. The company is led and managed by an independent team of executives with more than 75 years of combined financial industry management experience. EPIC’s end-to-end technological solutions have set a new standard for automating industry best practices and maximizing payday lender operational profitability. With a large team of full time developers and support staff in-house, EPIC is well equipped to ensure every client leading-edge systems performance and best-in-class service. For more information, please visit www.EPICloansystems.com or call 877-305-8742. IDology, Inc. provides real-time technology solutions that verify an individual’s identity and age for anyone conducting business in consumer-not-present environments to help drive revenue, decrease costs, prevent fraud and meet compliance regulations. IDology’s unique approach to identity in the payday industry has helped top online payday lenders improve the quality of the leads they purchase while reducing underwriting costs and lowering defaults. Founded in 2003, IDology is the only provider to offer an on-demand change management tool that allows client business-unit managers to control the entire proofing process, including within an integrated solution, without having to rely on internal IT resources or contact IDology’s customer service.